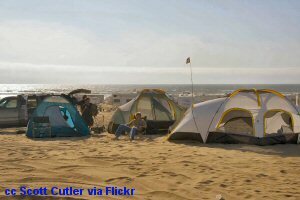 Central California beach camping - there are a number of options for camping on the Central Coast. From quiet and secluded campsites, facilities for horse camping and trail rides, to wide open beaches alive with vehicular activity. California on beach camping - while camping at the beach can be a money-saving option for a vacation or getaway, many visitors to Central California choose camping as their preferred means of accommodation. Which beach you might choose for your camping expedition really depends upon what sort of activities you might want once you're there at the beach. Or you might want to have your camp be a "base of operations" while you explore some of the nearby cities and towns. No matter your preference, chances are good that Central California has just the "right beach" for your beach camping needs. When you're done checking out the places to camp in Central California, do come by our Facebook page and give us a "Like". I share new photos I've taken and timely posts about interesting events and happenings that generally don't show up on this site. Thanks! Jalama Beach is remote, hidden and off the beaten track. It is also well known for its great surfing, wind sports and wide walkable beaches. This beach is a facility of the County of Santa Barbara and offers a number of choices for camping: tent camping, RV and now there are seven cabins available for rent. The cabins accommodate up to 4-6 people depending on the size. This is a windy beach. That statement holds true for many beaches, but especially for Jalama. That's a great thing for wind sports and surfing, but you should know this if it might be a problem for you. 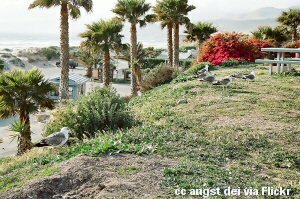 Jalama is also very popular as a day use beach. There is a small store with groceries and camping necessities as well as a grill which serves up the famous "Jalama Burger". Reservations can be made online at this page (opens in new window). This is a unique beach and camping area. There are miles and miles of dunes shaped by the wind. It's the only public beach in California on which you can drive (helpful to have four wheel drive, though) and the only one I know of where you camp right on the beach. Not close to the beach, or in sight of the beach or even a short walk to the beach, but right on it! The dunes are very popular with off-roaders and weekends find the 1000 allotted spaces for camping filled quickly. Oceano Dunes SVRA was formerly known as "Pismo Dunes". Google maps still shows it as "Pismo Dunes". They are the same place. There is a "Pismo State Beach" which borders the northern edge of the Oceano Dunes. Not the same place. In the Pismo SB there are two campgrounds - North Beach campground and the "Oceano" campground. These are nice developed site campgrounds, but NOT the same as Oceano Dunes where the camping is on the beach. There - hope that helps. Besides camping on the beach, there are numerous RV parks in the area. The Oceano Dunes site recommends four wheel drive on the beach, but you might want to check with them for specific questions here. Reservations and contact information here. 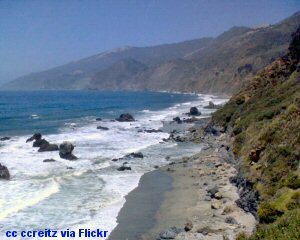 Reservations for all California State beaches and parks can be made by calling 1-800-444-7275 or at this site. As mentioned above, Pismo State Beach has two camping areas - the Oceano campground and the North Beach campground. 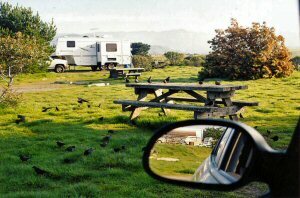 Located off Highway 1 in Oceano at 555 Pier Avenue, this camp has 82 developed sites for tents, trailers and RV's. Restrooms and hot showers. 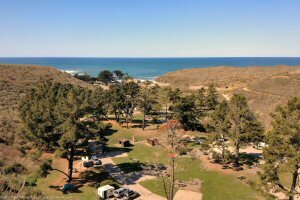 Located at the very southern edge of the city of Pismo Beach, this campground is just off Highway 1 and has 103 developed sites. This is adjacent to the Pismo Monarch Butterfly grove where the butterflies congregate over the winter and are seen in astounding numbers in the eucalyptus trees. Montana de Oro is one of the largest of the California State Parks and amazingly diverse and beautiful. There is a choice of camping here - a 40 site primitive campground beside Islay creek and just up from Spooner cove; equestrian camping areas; environmental camp sites and en route sites for self-contained vehicles. Full details can be found at their site here. More information and photos can be found on my page here. 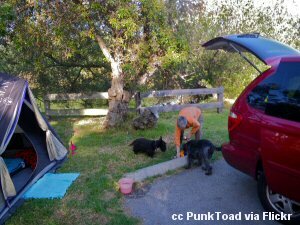 This campground is found north of Morro Bay and the Morro Rock and is very close to the beach. 76 campsites are to be found here with limited facilities (no hookups and no showers). Morro Strand is one of the California State Parks which were scheduled to be closed on July 1 because of the state's budget crisis. Some state parks have found solutions in partnerships with private groups, but I know of no such plan in the works here. The state has said that access to the "closed" parks would continue, but services like trash and sanitation would be discontinued. Since there wasn't much here to begin with, it might work if you have a self-contained unit 24' or less (which is the length limit here), but not such a good plan if you are tent camping. The San Simeon Creek campground is located just a couple miles north of Cambria on Highway 1. There is foot access to the beach under the viaduct over the creek. This camp has 115+ sites with an RV maximum length of 35'. No hookups are available, but there are flush toilets, coin operated showers and water spigots throughout the campground. There is a primitive campsite (Washburn campground) however this is a mile from the beach. 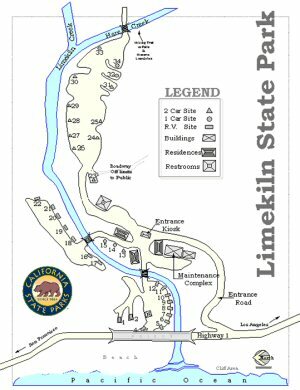 The beach campground is in the heart of Big Sur and is named for the big kilns still here which used to produce lime for the production of concrete. 28 campsites are to be found here (max. RV = 24'; max. trailer = 15') and they are tucked in among redwoods while only being a few yards from the beach. This is typical of what you'll find along the Big Sur coast. California has no monopoly on beach camping (although it is my favorite). A friend of mine has a site which does a marvelous job of covering all the details about Jekyll Island, Georgia and has a great page - Campground Guide for Jekyll Island. 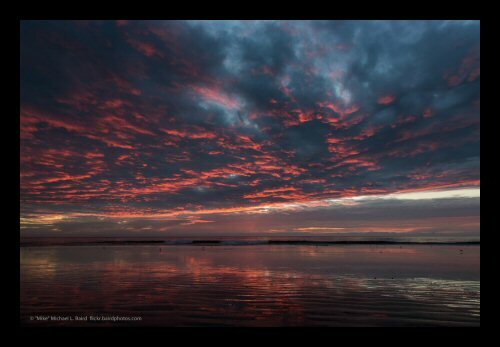 If you're looking for a place to vacation on the east coast, I highly recommend this site!